The decade of the 1930's was difficult for everyone, but especially for young Ellie Hogan, whose beloved husband dies suddenly. She decides to leave Ireland and return to New York City, a place that holds happy memories for her. But although the Depression has changed the city she once loved, Ellie is determined to create a new life for herself. She plunges all her energy into creating a home and refuge for some of the cities many homeless people. In return, she receives more love and friendship than she ever thought possible, and begins to feel the first faint stirrings of hope and happiness once more. And then someone from the past appears, someone she thought she would never see again - and pieces of Ellie's past that she thought were long gone suddenly resurface, threatening her newfound hope for the future. Ellie Hogan is a female character I refer to as the "teabag type" - she doesn't realize her own strength until she gets into hot water. I love stories about women who reach into their deepest selves and find their true mettle, and City of Hope is just such a story. 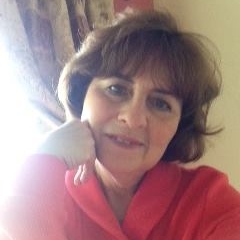 Author Kate Kerrigan has created a admirable, inspiring character in her Ellie Hogan, a woman ahead of her time in terms of ambition and ideas - added to that is her beautiful rendering of the historical period and a likable cast of characters. 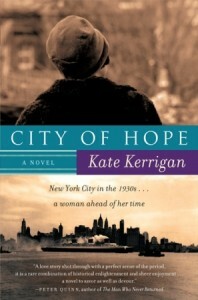 City of Hope was a fabulous addition to my historical novel library, and I'm eager to read Kerrigan's first novel Ellis Island. Thanks to TLC Book Tours for the opportunity to read this novel.